Last weekend I had the amazing opportunity to attend the exclusive Bacardi Triangle in El Conquistador Resort in Fajardo, Puerto Rico. Yes, this event took place right in my backyard. It was 3 nights filled with some of the funnest and most amazing moments I’ve had the pleasure of experiencing. I can’t go without saying that this past Halloween was probably the best one to date. The whole vibe of the place was awesome, everyone seemed like they were enjoying themselves and having an amazing time! Saturday during the day we went to a pool party at the hotel and had a blast, dancing to music and playing in the pool with a giant volleyball. At night I had the most fun at Palomino, a private island part of El Conquistador, where Ellie Goulding, Kendrick Lamar and Calvin Harris played. I had never seen them live and they did NOT dissappoint! Since pictures are much better than words, I will leave you with some of this weekend! This was my first time staying at Las Casitas Village, A Waldorf Astoria Resort, which is right next to El Conquistador, where all the fun and parties where at. Let me just say, the views were stunning and the staff was amazing! They made our little getaway very special! I can’t wait to come back! For my birthday I decided to treat myself and went to visit my friends in Costa Rica. It was an amazing experience that I will never forget. Most of my trip was spent in a little town called La Fortuna set on the foot of an inactive volcano. This volcano had been very active two years prior and you can still see smoke coming out of the top! This town is an amazing oasis where you come in contact with nature in all its glory. That is one thing I loved about Costa Rica: how civilisation has respected the natural surroundings. You can literally breathe fresh air wherever you may go, whether its in the capital of Costa Rica, San José or in the natural hot springs of La Fortuna. My friends and I stayed at the wonderful Montaña de Fuego Hotel , where we had an amazing experience thanks to Jeffrey Cervantes Calderón, Guest Services Manager (THANK YOU!). Everyone on the staff was welcoming and so nice, from check in to check out! It is definitely a place I recommend and that hopefully soon I will be coming back to visit and enjoy all the fun activities that La Fortuna has to offer. Among the leasure activities that can be enjoyed around the pool area and hot springs, that include a fun mud bath (your skin will feel soooo soft afterwards) there are plenty of adventurous activities fit for all types of thrill seekers. On the day of my birthday I went ziplining, tubing, rappelling and horse back riding along the mountain (my favorite part). 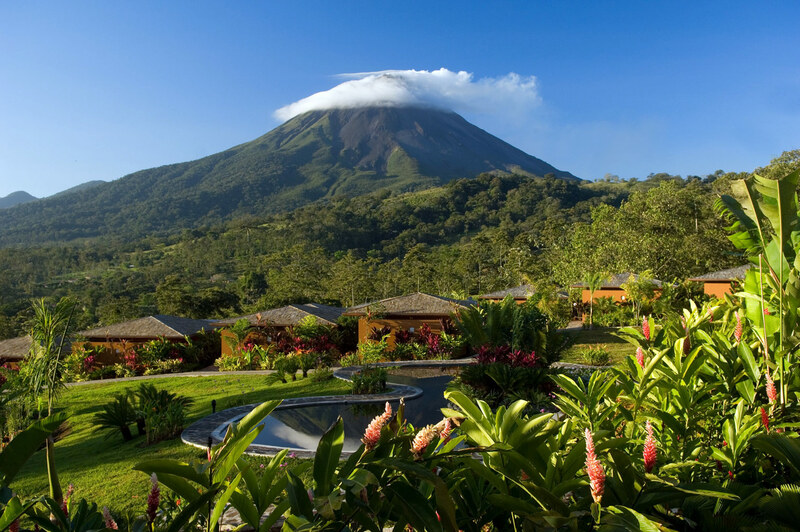 If you are planning a visit to Costa Rica, then you definitely need to visit La Fortuna and Montaña de Fuego! Here are some pictures in the gallery below to show you just how amazing La Fortuna is! Patacón Pisao’ – my favorite meal!